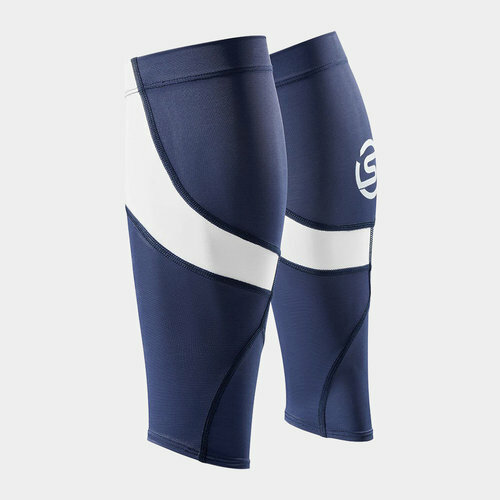 Specially crafted from the feedback given by athletes Skins have developed the unisex Essentials MX Compression Calf Tights in Navy Blue and White to help you take your game to the next level. These calf tights are crafted from two fabrics with the main body in a high denier warp knitted fabric and a lower denier fabric. The higher denier fabric provides a high level of compression and support for the wearer whilst still allowing them to move freely. The lower denier fabric can be found at the back of the tight towards the ankle which allows for natural extension and contraction of the Achilles tendon, useful to prevent the risk of injury and allowing blood circulation through the feet up and back up the legs. The seam placements in these tights also provide the muscles with added support. The tights are popular endurance runners, triathletes and high impact sports competitors.